This recipe is courtesy of Gluten-Free Consultant JoAnne Bennett Mirsky. (I added the greens.) It looks like a lot of steps but it’s really so simple. Preheat oven to 350°F. Spray 1 rectangular Pyrex or 2 square Pyrex dishes with nonstick spray and set aside. Spread a generous layer of tomato sauce on the bottom of the Pyrex dish. 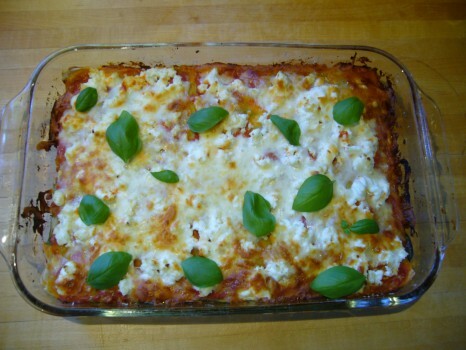 Arrange a single layer of lasagna noodles on top of sauce, completely covering the dish. 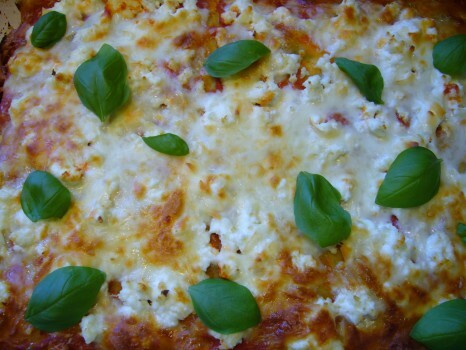 Sprinkle ricotta cheese, then Parmesan, followed by mozzarella. Cover the cheese with a layer of baby spinach. Arrange a second layer of noodles on top of the spinach and spread another layer of tomato sauce over the noodles. Sprinkle ricotta, Parmesan and mozzarella. another layer of tomato sauce over the noodles. Sprinkle ricotta, Parmesan and a very generous layer of mozzarella (more so than the other layers because you need it to cover the top of the lasagna). Bake COVERED for 30 minutes and then UNCOVER and bake for 15 more minutes. Let stand a few minutes and serve. Mangia bene!